HILLARYS TO ROTTO 1 WAY from $299pp HILLARYS TO ROTTO RETURN.. $540pp Private flight (min 2 pax). Available seven days from Hillarys Boat harbour with a minimum of 2 passengers, maximum 4 per flight. Whether it be a long stay or a day trip there is nothing quite like arriving by helicopter! 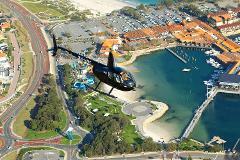 ROTTNEST TO HILLARYS ......from $299pp Private transfer flight minimum 2 passengers. 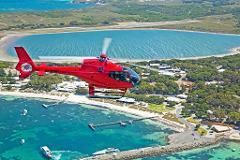 Fly one way from Rottnest to Hillarys Boat Harbour. (Plus $52.50 airport landing fee per helicopter per landing) Available weekends. Minimum 2 people. Price per person. HELI/ FERRY PACKAGE from $339pp. Private flight departs from Hillarys Boat Harbour. Click return box to book return ferry on the day of your choice. Min 2 pax. Landing fee of $52.50 payable. 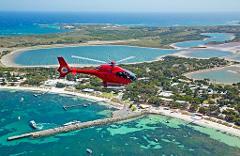 Fly to Rotto in your private helicopter and return on the ferry for just $339 per person. (Plus $52.50 landing fee). Available weekends. Whether it be a long stay or a day trip there is nothing quite like arriving by helicopter! One way flights from Rottnest to Jandakot are ideal if you are already on the island or we have already dropped you off by helicopter.